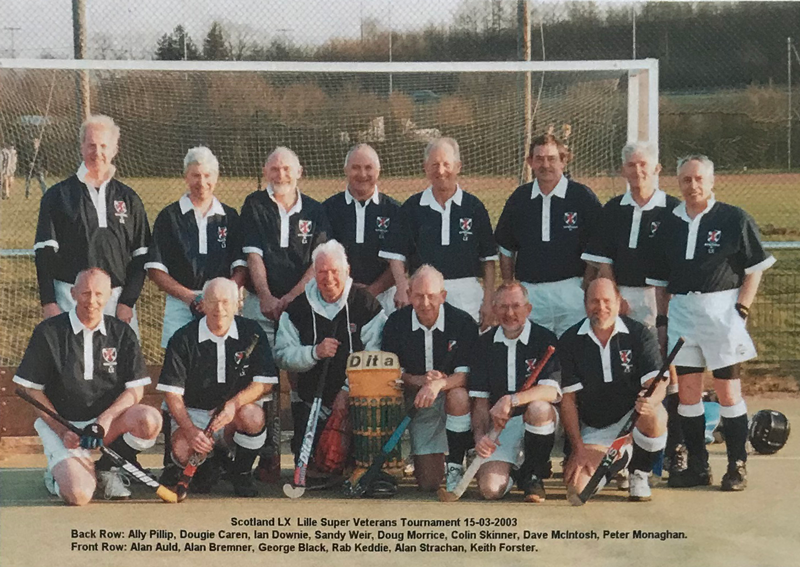 Following the very successful trip to France in 2002, the fledgling club returned to France the following March for the highly social LUC Ronchin Superveterans Tournament. Howard Andrew, Craig McCall, Harry Phillips and Jim White missed the Lille trip, Norrie Springford and Sandy Weir making their first appearances. The 2003 European Superveterans Tournament in Hannover was next, with Rab Keddie joining the squad for the first time, replacing Craig McCall - the only change in personnel from the 2002 squad. The year was rounded off with another social trip, to HC Voorne in Hellevoestsluis, Netherlands. Squad and partners: Alan Auld & Pam, George Black & Anne, Alan Bremner & Alison, Doug Caren & Carol, Ian Downie, Keith Forster & Ann, Dave McIntosh & Mary, Peter Monaghan & Marjory, Doug Morrice & Joan, Ally Philip, Alan Strachan & Kath, Sandy Weir & Jean. Umpire Gerry Toner & Jess. Matches for this tournament, in which we competed for the first time as Scotland, were 25 minutes each way. 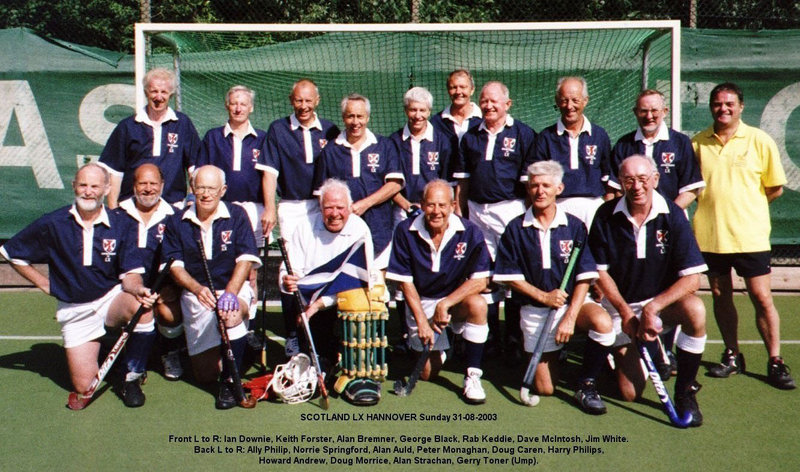 Scotland played England and Netherlands on the Saturday and finshed the tournament with a match against the hosts. The results are lost in the mists of time but Doug Caren scored one of the Scotland goals. The first item on the agenda was golf with some of the HC Voorne club members, then back to the club in the evening for matches against teams of local players and a few beers. The following morning, almost 200 players arrived to be formed into ad-hoc teams, each Scot being allocated to a team of eleven or twelve Dutch to play a series of friendly matches. Nearly all the Scots were put in the centre of midfield, whatever their normal position, on the basis that they were bound to be good players. After an intensive series of matches, the tournament ended and a Dutch select was picked to play an informal international against the Scottish team. It was years afterwards before the Scots found out that, during this match, the rest of the Dutch players were sampling oysters. Finally, it was on to the bar, where long tables had been set out and endless buckets of mussels served to tired and hungry players. Singing and dancing followed and of course there was an ample supply of wine and beer to help lubricate proceedings. Doug Morrice records “never has an international taken place between 2 teams so obviously knackered before the game began!”.